Over her third cup of rose tea, Rosie started to tell me about the inside of the cathedral. I’d expected it to be a maze of old rooms and dusty halls, but the truth shocked me. ‘No, it’s actually very modern. Kind of.’ She said. ‘How do you mean?’ I should have known better than to expect the rules of common sense and logic to apply here of all places. ‘Well, it all just looked so clean. I can’t really describe it that well, but it all looked like some kind of trendy modern art gallery. She finished her third cup of tea and asked for a fourth. I sipped my coffee and tried to think about it. I could picture a hundred different places in my mind which would fit her description – it was one of the benefits of spending too much time looking at random stuff on the internet. Eventually, I fumbled through my jacket pockets for a notepad and a pen before handing them to her. Rosie just smiled and shook her head and said ‘I’ve already drawn it’ before reaching into what must have been a hidden pocket in her dress and pulling out a folded piece of yellowed paper. She muttered something about how it had been a new sheet of paper when she went into the cathedral before carefully opening it up and laying it out on the table. “Rosie’s Map” By C. A. Brown (this illustration is released under a Creative Commons BY-NC-ND licence). 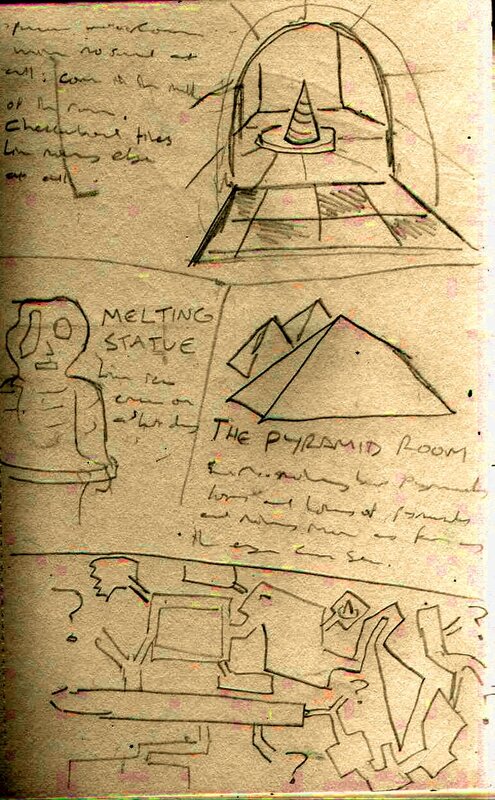 The thing that caught my eye wasn’t the melting statue, the pyramid room or even the bare room which contained nothing but a single spike in the middle of the floor – no, it was the map which Rosie had drawn of the cathedral. Part of it were missing. Some of the corridors even ended with question marks like something from the world map of an old computer game. Even the rooms which had been fully drawn were the kind of strange geometric shapes which you would only normally see on a tracksuit from the eighties. One of the rooms even looked like it had been torn in half – the wall at the far end of it was jagged and wavy and there was nothing but a big question mark next to it. When I asked Rosie about it, she just shrugged and shook her head again. We sat in silence for a few seconds before I thought about asking about the wooden models. She almost burst into laughter. ‘Oh, those things! They were pretty funny, don’t you think? I mean, I’d love to see whoever made them. She must have been a mechanical genius.’ She kept laughing. ‘No, they’re completely new to me. If it exists in this town, then I’ve probably seen it at least once before. Even that strange music shop on the high street. Whatever you do, don’t go in there. Those cymbals have a mind of their own and don’t even get me started on the euphonium in the corner.’ She rolled her eyes and somehow mimed an aggressive euphonium charging across a room. I really had to try not to laugh. ‘Are you serious? You’ve never seen them before?’ I asked again. She nodded again. I told her about the coffin in the back room of The Demon and about the ink. As I kept talking, she made frantic illegible notes on the back of the old piece of paper. I wasn’t sure why she was doing this, but I kept telling her about everything. Maybe it would all make more sense when it had been written down?